Please join us in our call for the withdrawal of military troops from civilian communities and the investigation of recent deaths due to indiscriminate firing in the Autonomous Region of Muslim Mindanao (ARMM). In the first week of August, military operations have intensified in several ARMM areas after three Phil. Army soldiers were killed in an ambush by suspected Bangsamoro Islamic Freedom Fighters (BIFF) members along the Fisheries Drive, in Mindanao State University (MSU) in Marawi City. The armed clashes triggered evacuations as villagers tried to elude the crossfire. But it seems that there is no safe place, as there are detachments even near residential areas. On August 7, farmer Ismael Abdula of Satan village, Datu Unsay was killed when he was hit in the head with a mortar shell that was suspected to have been fired from the nearby detachment of the Phil. Army’s 45th Infantry Battalion in Meta village. The explosion also damaged houses and killed three farm animals (carabaos). On Aug. 21, in Salbo village, in Datu Saudi Ampatuan, four-year-old evacuee Asmayrah Usman was killed when she was hit by a stray bullet on the right side of her stomach, piercing her lung. Her father, Mujahed Budi Usman, 33, was hit and wounded in the left foot, with the bullet going through to his thigh. The 1st Mechanized Infantry Brigade is based in Salbo village, but the evacuees suspected that the firing came from the direction of the military detachment in Bagan village, Guindulungan. Asmayrah’s family was among the residents who left Iganagampong village, Datu Unsay after firefighting broke out between the military and members of the BIFF in the first week of August. They sought shelter at the Mahad Norul Ittihad Evacuation Center, in Salbo village, Datu Saudi Ampatuan, thinking that they would be safe there. On Aug. 8, in another province, in Marawi City, Lanao del Sur, six-year-old Gaily Miraato was shot and killed by a stray bullet suspected to have come from the nearby detachment of the 65th Infantry Battalion, near the Agus hydropower plant. In the three incidents, the victims’ families reported that there were no BIFF members in the area, and the nearest armed group was the military. Evacuees from Dalingaoen village, Pikit town, North Cotabato province also reported that their homes and farms were damaged from the military’s mortar shelling during the first week of August. Soldiers have occupied civilian areas, such as the barangay health center in Iganagampong village, a school shed at the Maitumaig Elementary School in Datu Unsay, and the mosque at Bagan village, Guindulungan. Since early August when the Phil. Army first clashed with the BIFF, Kawagib had reported some 30,000 evacuees in six Maguindanao towns. The latest are the 200 evacuees from Datu Unsay town. 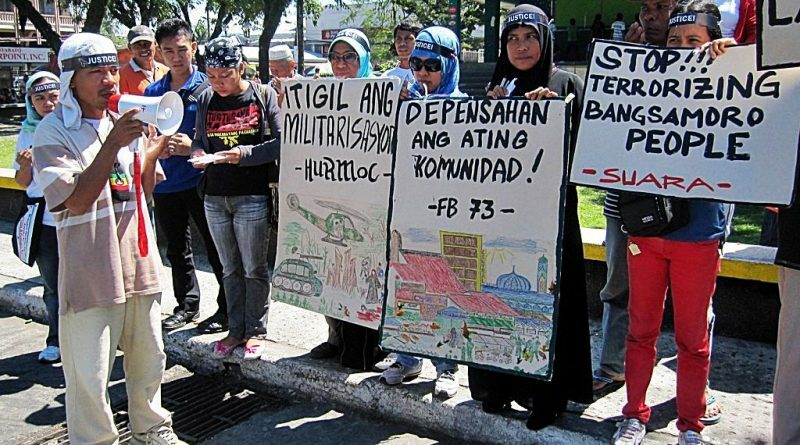 The immediate withdrawal of military troops from civilian communities in the Autonomous Region of Muslim Mindanao. The immediate formation of an independent fact-finding and investigation team composed of representatives from human rights groups, the Church, local government, and the Commission on Human Rights that will look into the arbitrary killing of Ismael Abdula, Gaily Miraato, and Asmayrah Usman; and the wounding of Mujahed Budi Usman. The Philippine Government to be reminded that it is a signatory to the Universal Declaration of Human Rights and that it is also a party to all the major Human Rights instruments, thus it is bound to observe all of these instruments’ provisions.